This Tour begins and ends at Rome (FCO) Airport. The Tour rate does not include roundtrip airfare. You can plan to arrive in Rome a few days early, and/or you can also add some time in Rome at the end of your Tour. 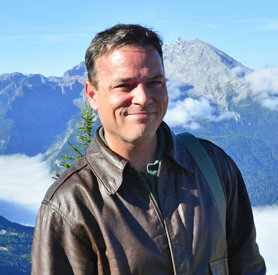 Palermo, Gela, Troina, Taormina, Sicily; Salerno, Monte Lungo, San Pietro Infine, Cassino, Gran Sasso, and Anzio to Rome, Italy . 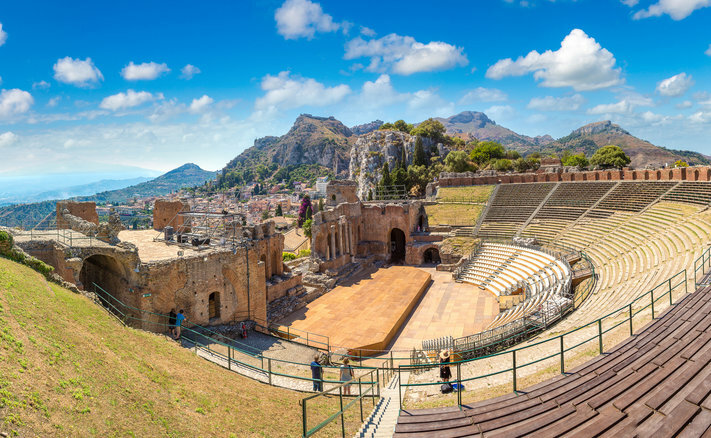 . .
Alpventures® Battleground Italy Tour heads directly from Rome Fiumicino Airport by flight to Palermo, Sicily. We spend our first night in Palermo then continue south through Patton's Seventh Army area at Caltanissetta to the landing beaches at Licata and Gela. Discover the historic city of Siracusa (Syracuse) on the island's eastern shores, and visit the impressive War Museum in Catania. 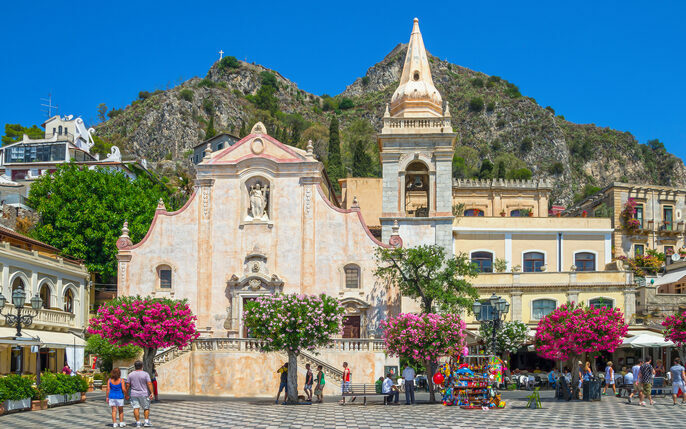 You will also see the infamous Mount Etna during our two nights in the enchanting resort of Taormina, before we head north across the Strait of Messina. From southern Italy we continue north through beautiful Calabria, to the medieval village of Morano. Spend a night in a restored 18th Century Merchant's Villa, before we continue north to Salerno. 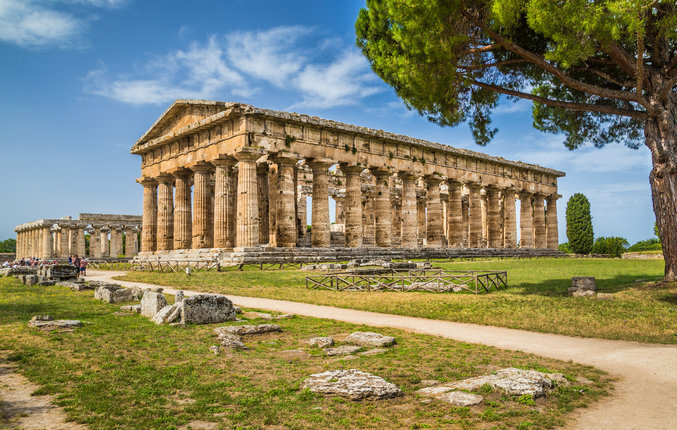 Enjoy the beauty of the majestic Amalfi Coast as we take in the Salerno Battlefield and Beachhead and visit the ancient ruins of Paestum. We'll make a short photo stop at the palace in Caserta before continuing our journey north to Cassino and the Gustav Line. 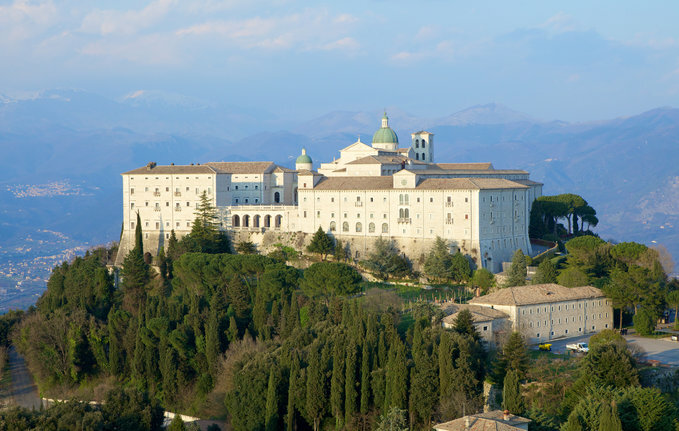 Enjoy a full Cassino Battlefield Tour, including stops at Mignano Pass / Monte Lungo, San Pietro Infine, San Angelo, the city of Cassino, and finishing at the famous mountaintop Monastery of Montecassino. Next, we head to the top of the Apennines Mountains and visit the place where Benito Mussolini was rescued by German Commandos in September 1943. 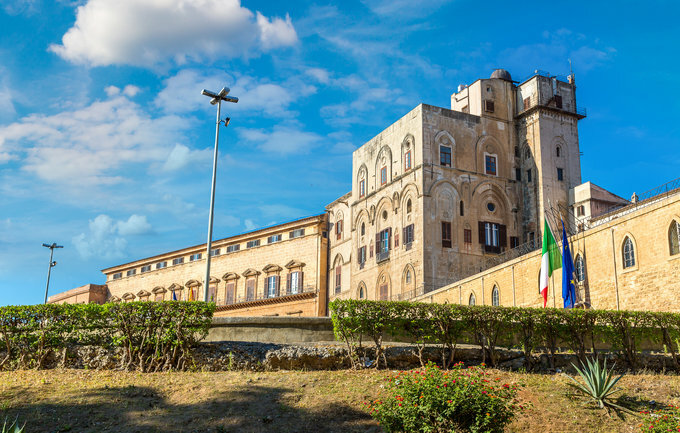 Take an exciting cable-car ride (weather permitting) to the top of the Gran Sasso and see the locations where the most daring raid of World War II happened. Overnight near the base of the cable-car in village of Fonte Cerreto. We continue the trip with stops in Anzio and Nettuno. 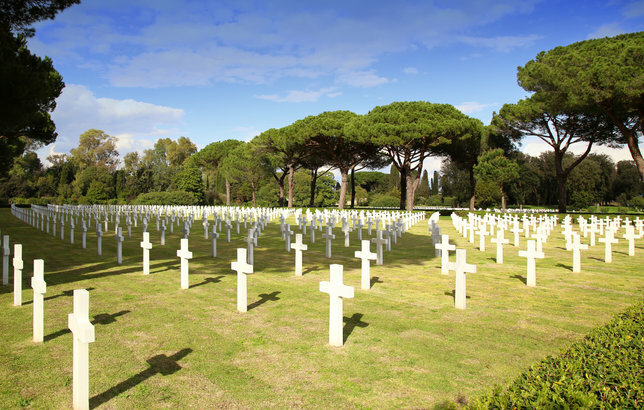 The Tour concludes with a visit to the Sicily - Rome American Cemetery near Anzio. We spend our last night near the Rome Fiumicino Airport. You can also book a later return flight home and spend a few more days in Rome, or somewhere else if you wish. Book your hotel rooms and private tours and transfers on our website, or contact us for details or help with your travel plans. NOTE: This is your departure date (if leaving from the USA). 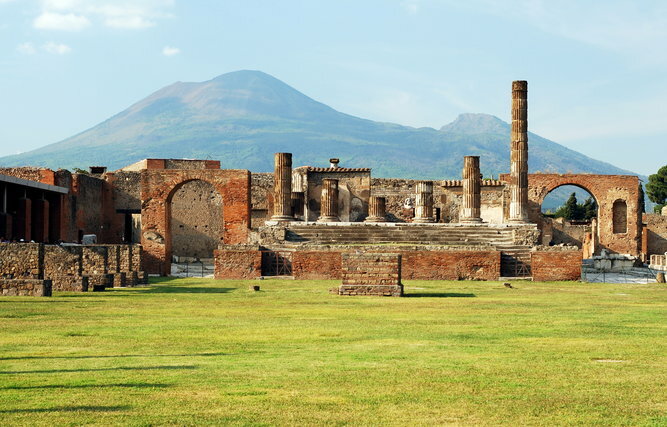 The Tour actually begins the following day at the Rome Airport, when the Tour Group gets together for the first time. It is also possible to come in to Rome a day or two early to do some sightseeing. Breakfast and hotel check-out. Transfer to Rome airport for flights home. Tour Rates do not include Airfare. A completed and signed Tour Reservation Form and a refundable $400 deposit (per person) are required to book our Tours. To book online: scroll to the top of this page and click the "Book Tour" button. You can adjust the quantity of people on our secure payment pages with PayPal. Payments are made to: ALPVENTURES. Payment in full is due 90 days prior to Tour departure, and must be paid in US Dollars by check. Credit cards are accepted for the deposit only; and cannot be accepted for final payment. Whether on the battlefield, or inside the impressive museums, you won't miss a thing as we give exciting, detailed accounts and informative historical presentations throughout each Tour. From the D-Day beaches of Normandy, to Hitler's Eagles Nest and beyond, our top priorities are your safety, comfort and enjoyment on Tour. Alpventures® World War II Tours are the result of over 20 years of historical research and first-hand, local guiding experience, making them especially unique. Our superior accommodations are all extraordinary three- and four-star hotels; some of which are even medieval castles and listed historical monuments. Join our small groups on a World War II Tour and experience an historical adventure to Europe!